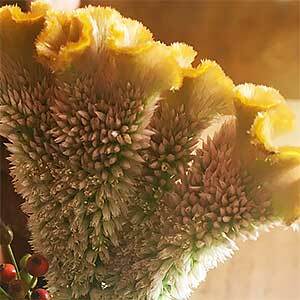 Grown for the exotic flowers Celosia cristata is usually grown as an annual and are widely used as cut dried flowers. They look great in the garden as well and can also be grown in containers. Flower colour ranges from reds through to orange and yellow and the common name is ‘Cockscomb’ and sometimes ‘Wool Flower’. Most gardeners will grow Celosia from seed, and these are best sown in spring as the weather warms up and the danger of frosts is over. Generally the seeds are sown in trays indoors and then transplanted to the garden or container. How to germinate Celosia cristata seeds. The seed is very fine and should be sown onto a fine soil or potting mix. Lightly cover the seed with sifted soil. Keep moist using a mist spray until the seeds germinate. Germination will take around 2 weeks. Once the seedlings become large enough to handle they can be transplanted to a permanent position. A position with good sun is essential. Prepare the soil by digging in good amounts of compost and aged cow manure. Although moisture is required the soil should also be free draining, wet soggy soils are not suitable. The seedlings should be planted and then watered in. Do not allow the soil to dry. Fertilise issuing a liquid fertiliser are 2 – 3 weeks. Flowering will occur from mid summer into autumn. To promote more flowers, tip prune the first flower buds away, this will create a bushy plant with more flowers. Two types of Celosia are available, smaller growing and larger growing.